Sintillia's Silver Glow Sunglass Strap features a vintage inspired silver colored chain. This style is _skinnyî (6mm) and is lightweight, thanks to its hollow center. 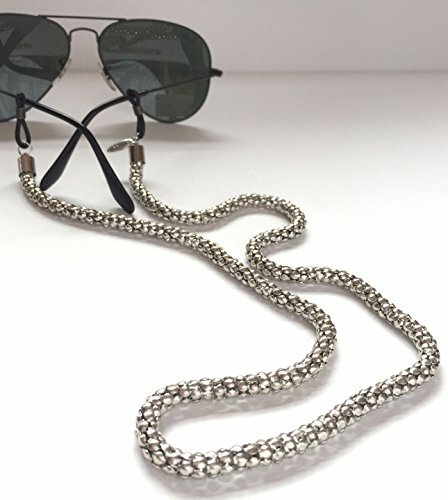 The Silver Glow Sunglass Chain is 23 inches long. This style is also available from Sintillia in Gold and Rose-Gold. The attachments are adjustable to fit any size eyewear by sliding the metal spring up and down. A much cuter take on the traditional _croakieî youll love wearing your Sintillia chain on a daily basis. Sintillia is about celebrating life and being adventurous. All sunglass straps are designed and inspired by a combination of hair-pieces and body jewelry. If someone is going to invest in an expensive accessory like sunglasses or everyday eyewear, there should certainly be a fashionable way to protect them! It's the perfect addition to a music festival, wedding, travel, beach, BBQ or holiday outfit. Basically anywhere the sun may take you, Sintillia is there to serve as both a fashionable & practical addition to your attire. Sintillia believes every accessory should be a personal expression, and sunglass straps or eyewear chains are no exception to the rule.